The Tiger Balm Gardens a.k.a. 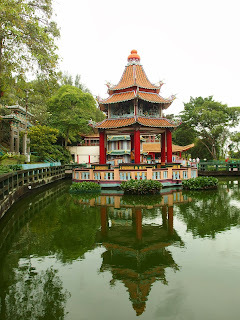 Haw Par Villa is an oriental theme park located on the Southwestern side of Singapore. It is famed for depicting traditional Chinese legends, in particular – the unforgettable 10 Courts of Hell. A similar garden had been built by the Aw brothers in Hong Kong. I think that the garden in Hong Kong has been demolished to make way for the ever growing skyscrapers Hong Kong is famed for. 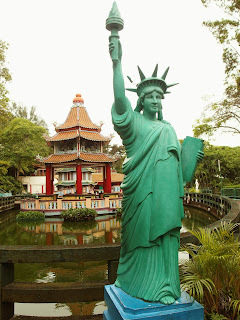 Thank goodness, the Haw Par Villa Gardens in Singapore is still around while we were there! It was the only place in Singapore that gave us very fond memories of…till now. If you’re in Singapore for vacation, this is the first place you should see if you’re into Asian mythology…. and the Statue of Liberty! Till now, I seriously wonder what the hell is that iconic landmark of the U.S.A. is doing here!! Not to forget mentioning, Kangaroos from Australia?! 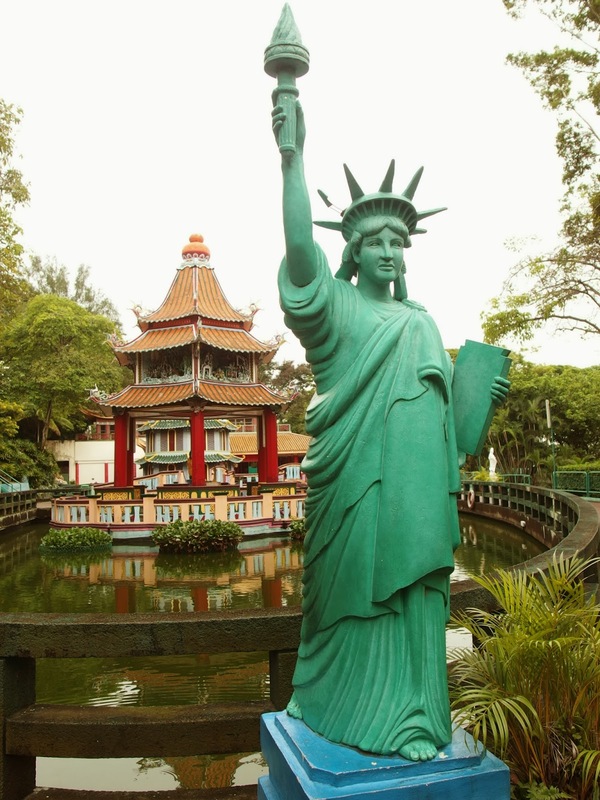 Haw Par Villa is a mix and mash of different cultures from all around. It’s seriously messed up…BUT I LOVE it! Messed up is good and that always does it for me! Prepare to see Dragons, Phoenixes to Kangaroos & Koalas alongside Chinese Deities, Temples and Hell itself! The Gardens was first built by Mr. Aw Boon Haw for his brother, Mr. Aw Boon Par in 1937. Boon Haw acquired the hill-side property in 1935 and spent US$1.95 million and two years to build his fantasy world. Born in Burma, Boon Par relished his British education, whilst his elder brother Boon Haw rebelled against it. In their adulthood, they concocted the pain-relieving ointment, popularly known as the Tiger Balm, which soon became a household brand. Boon Haw was known to be a philanthropist contributing over half his income to charities. Owing to his exposure to both Eastern and Western culture, Boon Haw sought to create a park which told traditional Chinese stories but displayed it in a modern, Western way. As both brothers were affluent, the park had to reflect their level of prosperity. When it was opened in March 1937, the sprawling villa had a recurring theme in its compound: the circle motif. This was meant to represent family harmony. In fact one of the reasons for building the Tiger Balm Gardens was to create a public space for families to visit and recount Chinese tales and stories. In the early days, the Gardens had a zoo of live animals. Unfortunately, Boon Par did not reside in the villa for long. He fled to Burma with his family before the Japanese invasion. During the war, the Japanese occupied the villa, using its hill-side location to keep a watch over ships at sea. When the Japanese left Singapore, the villa suffered damage from residents who vandalized it out of hatred for their then-captors. Boon Haw returned to Singapore from Hong Kong, only to be greeted by an abandoned villa. His brother sadly, had died in Burma. Boon Haw did not make any major renovation changes to the villa, except for the removal of the shattered remains. His nephew continued to add sculptures of Chinese folklore to the garden. Boon Haw had intended a stroll in the garden to be a trip to the world of Chinese mythology. Every statue to this very day has an interesting story behind it. In 1988, the Singapore Tourism Board took over the running of the Haw Par Villa Gardens. Re-named Haw Par Villa Dragon World, it became a popular tourist spot. The magnificent statues were restored and the original flavor retained. Visitors to the theme park were treated to plays, acrobatic displays and puppet shows depicting Chinese stories. However, the exorbitant entrance fees discouraged the public and after 10 years of operations, the management incurred a loss of $31.5 million Singapore dollars. In March 2001, the Singapore Tourism Board re-named it Tiger Balm Gardens and the public has since been treated to visit it without charges. Apart from the wealth of moral tales in the gardens, the Tiger Balm Gardens has been restored in the people’s minds as a place of cultural heritage and an emblem of Boon Haw’s generosity. This is Part 2, so stay tuned for Part 3!